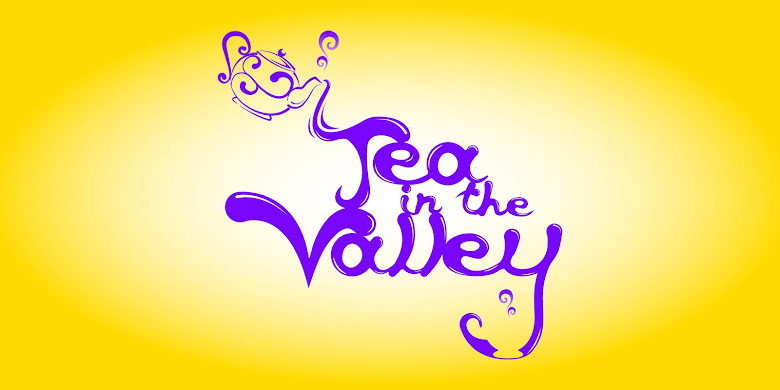 Tea in the Valley: Some bunny loves tea! The bunnies are out in full force in the Valley. My green/white toile rabbit teapot was a HomeSense find from a few years ago. My violet chintz tea set includes a teapot, sugar, creamer, and 6 demitasse cups and saucers. 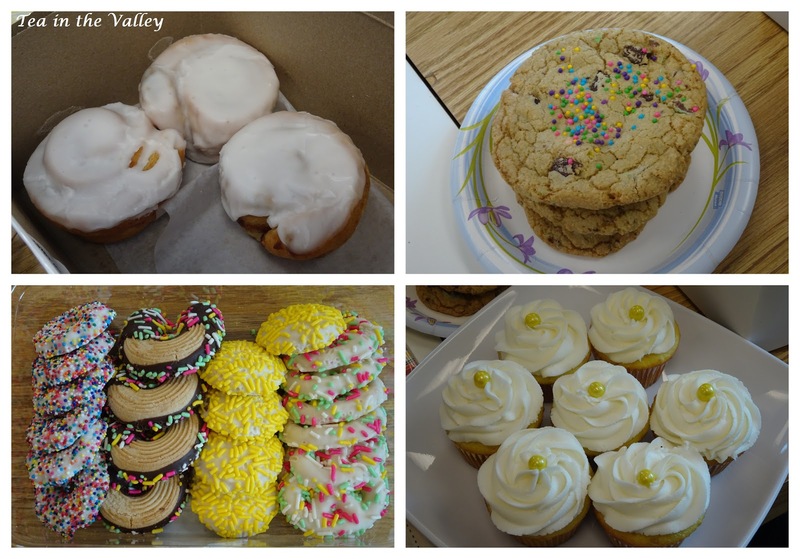 Last week, we had an Easter-themed tea social at work. 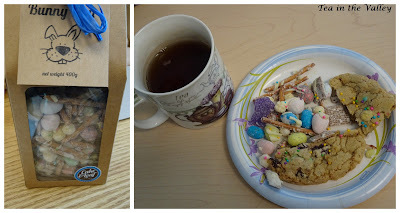 My cup of Tiger Eye Black Tea (a chocolate and caramel tea by Adagio Tea) and some "bunny mix" and cookies. Wishing you a joyful Easter season! Love that bunny teapot; a sweet find! Another fun tea social. I think it's lovely that you have this respite at work. Must be a nice work place. Have a lovely day, Margie, and Happy Easter! OMG ..That chocolate and caramel tea sound fabulous..you always find interesting teas that I haven't tried. You work social looks yummy and so healthy too. Home Sense always has colorful china.. and you surely did find a " Hare' raising litte teapot.... I think even Perter Rabbit might stop over for tea with you especially if you supply the carrots and the bunny mix cookies... Wishing you a Happy Easter. Oh I love the chintz set! Looks like you guys pulled off another amazing tea at work . 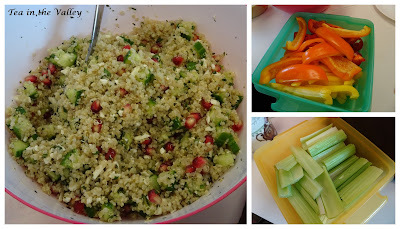 . . everything looks so yummy (except the veggies haha!). Seu bule de coelhinho é muito lindo.Boa Páscoa. Rabbit teapot is really sweet. Wish you a wonderful Easter! Margie, I like both those teapots. A dear friend gave me a Peter Rabbit teapot several years ago. I've still never made tea in it, but it's always on display. What an adorable bunny teapot! Perfect for Easter. Your chintz tea set is pretty. I hope you enjoyed your office tea time. Happy Easter. The teapot is so cute! I always love to hear about your tea socials at work, which I'm sure everyone loves. It must make for a kinder, gentler work environment.